I love reading about food trends, and if there’s one that is definitely going to be big in 2015, it’s broth. Everyone from Joy The Baker to The New York Times to The Guardian have called it, and broth is becoming a trendy alternative pick-me-up to coffee. I began to read voraciously about broth after reading about Hemsley +Hemsley in Goop and The Coveteur. I’ve been following the Hemsley sisters’ work obsessively online for the past month or so, and since broth forms the basis of many of their recipes, I figured I’d give it a try. I’ll admit, I’m the queen of the stock cube. Whether it’s soup or pasta sauce, I reach for stock cubes and throw them in- they are convenient and give a quick taste-boost. It’s not that I haven’t made my own stock before- I have, but stock cubes are just more convenient. And who’s going to save fish, chicken and mutton bones anyway? When I buy fish, I almost always get it filleted so that I can use it for curries, pan-frying or preparing en papillote. Chicken is either boneless, drumsticks or a curry-cut; I rarely roast one whole. Boneless strips are stir-fried. Drumsticks are turned into a Kerala-style chicken fry; and a curry-cut becomes an easy one-pot chicken curry to go with rice or rotis. So chicken bones are just discarded. Mutton too, is made into a curry and we end up chucking the bones after we finish our meal. Anyhow. After reading so much about home-made stock or broth, I had to give it a try. I made a bean-and-kale soup the other day, and instead of using a stock cube, I made my own stock with some aromats (onions, carrots, celery, peppercorns, garlic, ginger,) and a handful of bony mutton pieces. Not bones, but small bony pieces. I put everything into a ceramic dutch oven, poured some cold water over it and allowed it to simmer for 2 hours. I then strained the liquid and went on preparing the rest of the soup, adding tomato puree, beans, vegetables, herbs and kale. A stock cube is definitely easier, and the flavour is stronger- and saltier. The homemade stock, however, had a much more well-rounded flavour, though subtler. For broth as a meal, I thought I’d take small steps, and zeroed in on a simple recipe from It’s All Good. Ginger-scallion broth with soba noodles. I replaced the soba noodles with some quick-cooking brown rice noodles, and I prepared it without the seaweed. Still really, really good. The slow simmer really brings out the flavour and kick of the ginger, and it makes for a light, soothing and flavourful meal-in-a-bowl. 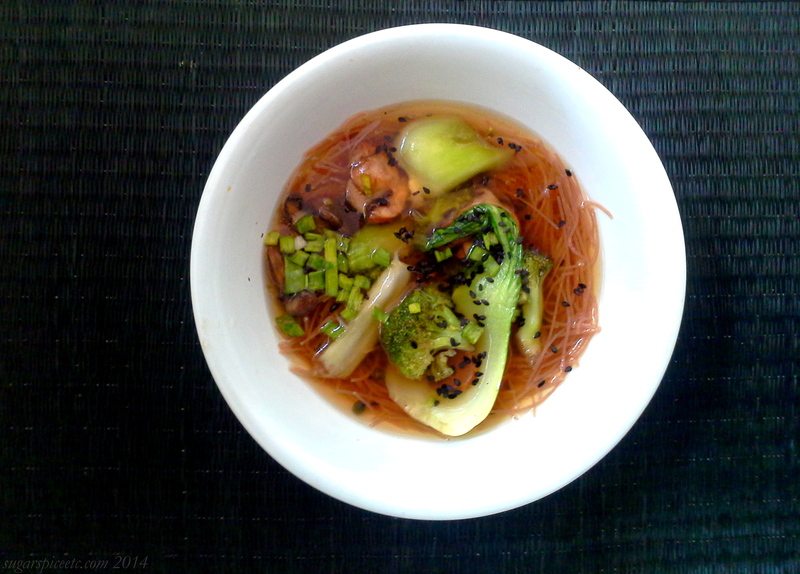 I topped the noodle broth with stir fried vegetables, but chicken, seafood, meat or tofu would work just as well. Combine the ginger, scallions and soy sauce with 3 cups of cold water and bring to a boil. Once the liquid boils, lower the heat and simmer for 10 more minutes. Add some mint leaves and cilantro, cover with a lid and allow the broth to rest for 5-7 minutes. Strain the liquid and set aside, covered. Meanwhile, cook the brown rice vermicelli according to package instructions, drain and set aside. Divide the noodles evenly between 4 bowls, ladle the broth over it, and top with the thinly sliced scallions. Add some stir-fried veggies/chicken/meat/tofu to make it a full meal! You know I love sugar. It’s in the title of my blog. I consume quite a lot of it. And I know it is not ideal. When I know it’s getting too much, and my skin starts to show signs of it, I just cut back. I’ll forego chocolate altogether, and eat nuts and fruit for a sweet fix after a meal. (Ideally, one should be doing that most of the time…but alas! I am, at my core, a dessert-adoring, sugar-loving human.) I have tried, but while I am able to cut back, I can never really cut out dessert completely. It’s the Gretchen Rubin moderator vs abstainer theory- except I fall into neither category! I find it easier to stay off sugar completely for pockets of time, (meaning no peanut butter, no jelly, only pesto on my toast,) instead of lowering my sugar intake. After I’ve been off it for a while, I’ll start to indulge again, slowly (but surely!) And then, I am once again consuming more than I should, so I go back to abstaining for a while. It’s an unhealthy pattern, but it’s how I get by. But…there is a way, you know. Apart from abstaining and moderating. Healthy desserts. The kind without gluten, or sugar, or dairy, like a Babycakes NYC cupcake. I’ve been reading some special diet/healthy cooking blogs for a while now, learning more about vegan, gluten-free, whole-food and raw diets. And if you are looking to understand more about raw food, Laura Miller’s Sidesaddle Kitchen is a great resource. On her YouTube show Raw.Vegan.Not.Gross, she dishes up some pretty decadent lookin’ brownies, cake, and ice-cream, using all-natural, raw, unprocessed ingredients. While I won’t be making cauliflower pizza or walnut ‘meatballs’ anytime soon, her dessert recipes are more approachable and a good starting point if you are interested in eating raw. 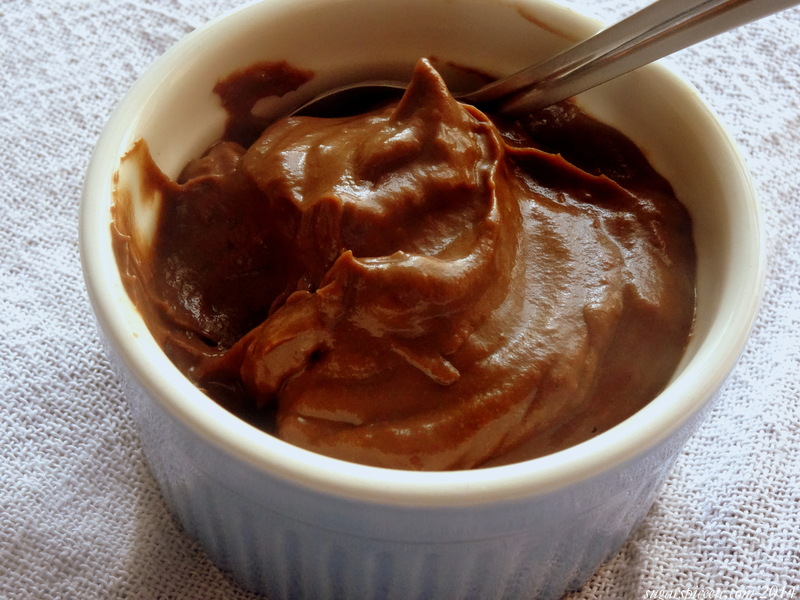 Chocolate avocado pudding is nothing new- I encountered it first on Fitsugar, and was surprised at how rich and creamy it looked. Not runny, not sticky, just glossy, a little firm, and creamy- like Jell-O pudding. And after I saw Laura’s version (even glossier and creamier,) and learned the health benefits of this magic pudding, I made a trip to the grocer the next day to pick up some avocados. I didn’t follow the recipe exactly. I left out the nama shoyu- but I did use the balsamic and increased the salt to ½ teaspoon since I was not using nama shoyu. Also, I used light olive oil instead of coconut oil, because the coconut oil here in India has a much stronger, nuttier flavour, which would be overpowering. Blend all ingredients in a food processor or blender. Serve! ♥ Convenience: I give this recipe a 10/10. It’s quick and easy and comes together in minutes, all you need is a blender and your ingredients measured out. ♥ The Health Kick: Well, it’s definitely better for you than Nigella Lawson’s chocolate pots de crème. 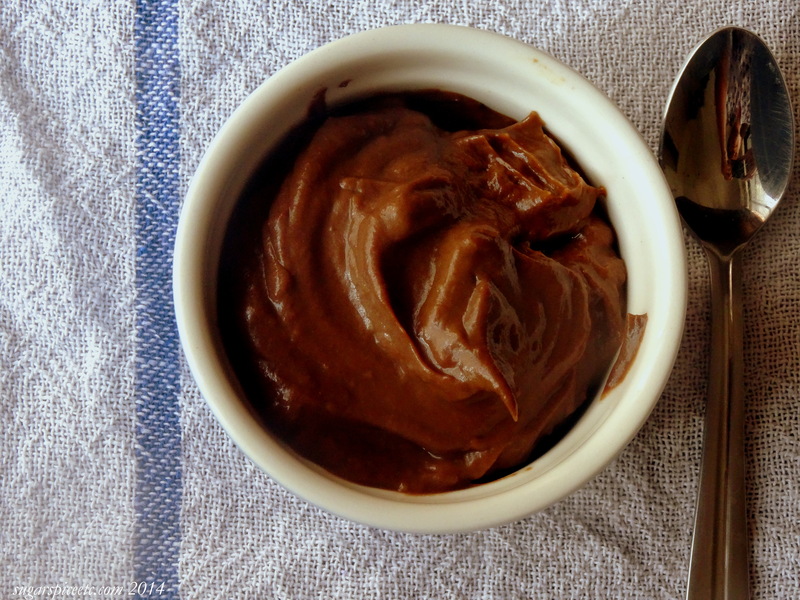 Just avocado, natural sweetener and cocoa powder- no eggs, cream or butter, but the same dreamy, rich texture! ♥ The Taste: Hmmm. It’s good folks. Pretty darn good. But somewhere, I did feel like I was eating a chocolate-flavoured avocado. Perhaps it had to do with the quality of the cocoa powder- had I used some phancy raw cacao powder, I’m sure it would have added a richer chocolate taste. Do you like attempting healthier desserts or would you rather indulge in old-fashioned bad-for-you desserts once in a while?